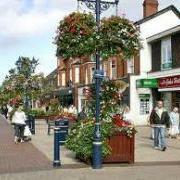 The present Metropolitan Borough of Solihull has existed since 1st April 1974 when the Local Government Act 1972 came into force and created the Solihull Metropolitan Borough Council. This new Metropolitan Borough was formed by merging the old County Borough of Solihull with parts of Stratford and Meriden Rural District Councils. The Council wards span both Parliamentary constituencies of Meriden & Solihull.